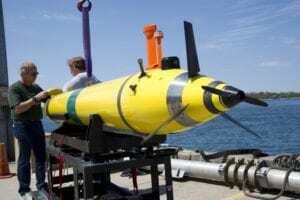 Remote Environmental Monitoring UnitS, or REMUS vehicles, are low-cost autonomous underwater vehicles (AUVs) designed by the Oceanographic Systems Lab to operate with a simple laptop computer. Initially conceived for coastal monitoring, these torpedo-shaped vehicles are now used as platforms for a wide variety of instruments at a range of ocean depths. 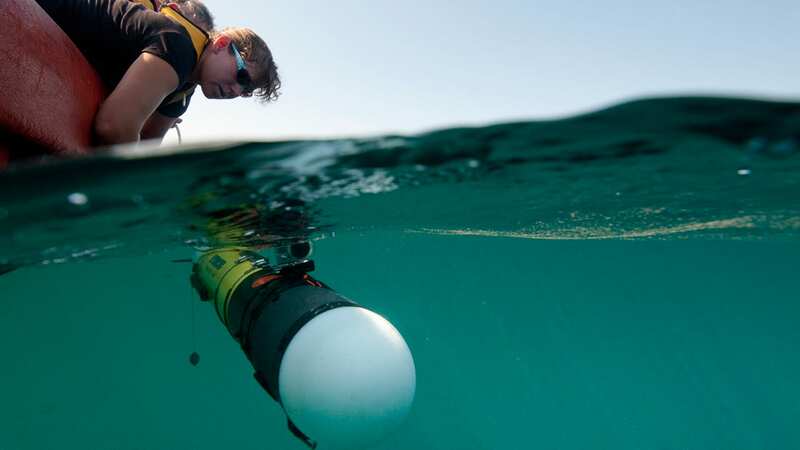 REMUS are particularly well suited for surveying and mapping, travelling methodically over an area like a lawnmower to sample key ocean characteristics. REMUS vehicles use a propeller and fins for steering and diving. After entering the water, the AUVs use acoustic navigation to independently survey an area while sensors inside sample and record data. Inside each REMUS vehicle is a control computer that functions like a miniature laptop computer. Another REMUS, known as the Tunnel Inspection Vehicle, was specifically adapted to survey New York City’s Delaware River Aqueduct for leaks. REMUS 100 is a compact, light-weight, autonomous underwater vehicle designed for operation in coastal environments up to 100 meters in depth. The REMUS 100 can be configured to include a wide variety of standard and/or customer specified sensors and system options to meet your unique autonomous mission requirements. 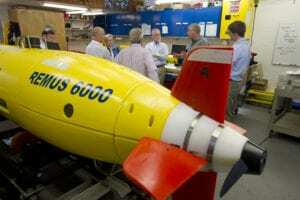 The REMUS 3000 is similar to the REMUS-600 in vehicle size, however this vehicle, constructed out of titanium, can swim to much deeper depths and it carries a more advanced sensor package for underwater mapping and imaging. 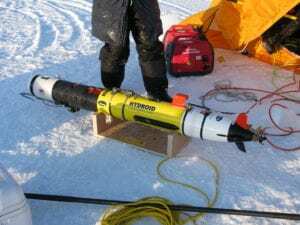 The REMUS 6000 is an innovative, versatile research tool designed to operate in depths ranging from 25 meters (82 feet) to 6,000 meters (19,685 feet or 3.73 miles), allowing for a wide range of autonomous operations. The WHOI Tunnel Inspection Vehicle (TIV) was built in 2004 to inspect a 45 mile section of the Delaware Aqueduct and to, ultimately, find its leaks. 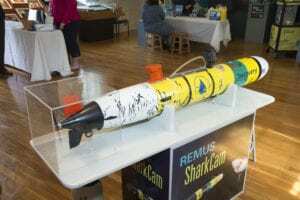 SharkCam is a specially adapted REMUS 100 vehicle equipped with video cameras and navigational and scientific instrumentation that enable it to locate, track, and closely follow a tagged marine animal, such as a North Atlantic white shark (great white). Using technology similar to SharkCam, TurtleCam follows a turtle with a transponder attached, capturing its movements on video and measuring the salinity, temperature, depth, and current speed in the water around it. Q. How does REMUS work? A. As REMUS travels back and forth through the water, it resembles a lawnmower moving over an area. In fact, researchers sometimes say that while REMUS is working it is “mowing the lawn.” All of these movements are carefully prescribed through parameters that are downloaded into the vehicle's control computer before a mission. After entering the water, REMUS uses acoustic navigation to independently survey the area while sensors inside the instrument sample and record the data.A few short lessons allows a person to learn how to program a REMUS mission then launch, recover, and process the data. More than one REMUS can be used with different sensors to increase the data gathered or area covered. Researchers are working on technology that soon will allow REMUS vehicles to reliably communicate with each other or the operator during the survey using underwater acoustic modems.REMUS navigates with an acoustical system that uses 20 to 30 kilohertz transponders deployed using Global Positioning System (GPS) satellites. REMUS has three motors, each with its own controller, that operate the propeller and two pairs of fins used for steering and diving. Inside each REMUS vehicle is a control computer that functions like a miniature laptop computer. It sits on a custom motherboard that includes digital signal conversion channels, input/output ports, and power supplies. Q. What platforms are needed for its use? A. The shallow water version of REMUS can be launched from a small boat or even deployed from a dock or on the beach. Q. Is there more than one type of REMUS? A. There are several versions of REMUS. 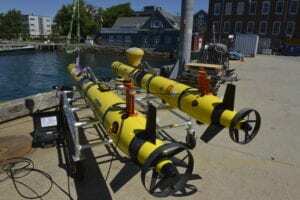 The deep ocean version, known as Semi-Autonomous Mapping System (SAMS), dives to 6,000 meters (3.7 miles) and can be operated from most any research vessel or ship that can accommodate a portable lab. In addition, there is a mid-water depth vehicle currently in design and testing. Engineers say that it will be smaller, easier to handle, and have a more flexible shape than the SAMS vehicle. Another type of REMUS was employed to visit unexpected places- tunnels. The Tunnel Inspection Vehicle (TIV) was specifically adapted for insertion into the tunnels of the Delaware River Aqueduct to survey the tunnel walls for leaks. In June 2003, this custom-designed REMUS swam several hundred feet below the Catskill Mountains and Hudson River to inspect a 45-mile section of the Delaware River aqueduct. The TIV completed the 15-hour survey, emerging from the aqueduct with 160,000 digital photographs and 600 gigabytes of data that fills 150 DVDs. All this data is being analyzed by engineers to determine where the tunnel leaks. Q. What are the advantages of using this instrument? A. There are several advantages: diversity of payload; both vehicle and operating costs are relatively low; and speed and accuracy of the survey exceed that of other platforms. A standard instrument suite would include a 12 kHz up/down-looking Acoustic Doppler Current Profiler (ADCP), side scan sonar (usually 900 or 600 kHz), Conductivity, Temperature, Depth sensor (CTD), and often an optical back-scatter sensor. REMUS can be configured with a diverse instrument suite such as a fluorometer, bioluminescence sensor, radiometer, acoustic modem, forward-looking sonar, camera, plankton pump, Acoustic Doppler Velocimeter (ADV), and video plankton recorder. REMUS is cost effective to operate because it does not require a large, sophisticated platform or vessel nor does it require a lot of training to operate or maintain it. REMUS can survey at 3 to 5 knots, faster and more accurately than a towed system. Multiple navigation modes (long-baseline, ultra-short baseline and dead-reckoning) allow for more accurate purpose-based navigation choices. Q. What are the disadvantages of using this instrument? A.The only disadvantage of REMUS is that it does not hover, which prevents it from performing high resolution, close-up imaging. The smaller versions of REMUS do not go deep. The large version (SAMS) requires a substantial support vessel and is a lot more expensive. Selecting the appropriate sensor suite and best version of REMUS for each application can eliminate nearly all of these potential problems. Q. Is there a patent on REMUS? A. REMUS was invented and continues to be developed at Woods Hole Oceanographic Institution. It is now manufactured by Hydroid Inc. of Pocassett, MA. Q. How big is REMUS, how deep can it dive, and how fast can it travel? A.The weight of each REMUS vehicle varies based on the weight of the instrument it carries. But overall, they are relatively small and lightweight, measuring 19 centimeters (7.5 inches) in diameter and weighing about 37 kilograms (92 pounds). The length starts at 160 centimeters (64 inches) and may also vary depending on the instrument payload. The basic, shallow water REMUS vehicles can dive up to 100 meters (328 feet) deep. It is capable of conducting an 80 kilometer (50 mile) survey while moving at a speed of 3 knots (that's about 5.4 kilometers, or 3.3 miles, per hour). Q. How was REMUS developed? A. In 1993 the REMUS vision began following the creation of Rutgers' ocean observatory LEO-15 in NJ. 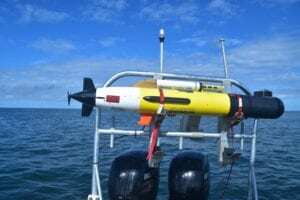 OSL engineers agreed that there needed to be an underwater tool that could measure oceanographic episodes with greater spatial variance accurately, at a small cost. 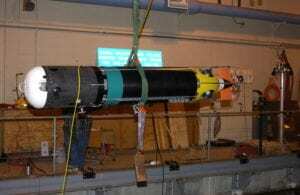 This underwater tool or AUV became known as Remote Environmental Monitoring UnitS (REMUS). OSL, the home of REMUS, began early on with projects like TOSSand RATS. The first REMUS was built in 1995. In its early deployments, REMUS was fitted with sensors like an ADCP, CTD and sidescan sonar, and would determine its position by transmitting a coded ping to transponders or beacons, set in the ocean at a known location, and it would wait for a reply. The range and bearing of the reply allows REMUS to determine its location. The acoustics, coupled with bottom lock using the ADCP, will allow the vehicle to navigate along a known track line and can be followed on for an entire mission. Today REMUSing is even easier. Most vehicles are now outfitted with GPS, WiFi (wireless) and even Iridiumcapabilities. Also, we have integrated an inertial navigation system known as Kearfott, which uses ring laser gyroscopes to orient the vehicle spatially and accelerometers to then sense changes in speed and velocity, completing a navigation package of both precision and confidence. The strength of REMUS is its versatility. REMUS is commonly referred to as a pick-up truck, allowing the vehicle to carry a plethora of sensors. REMUS can be operated in fresh and salt water, in open ocean or even narrow rivers (also water aqueducts). Because of REMUS' small size, it can be operated with only two people and can be launched and recovered from a small vessel with very minimal handling equipment. The OSL is a team of engineers, technicians and staff that design and operate REMUS. Since 2001, several models of REMUS have been built by Hydroid in nearby Pocassett, Mass.